Last night Cate and I ventured into the fascinating and awesome world of private kitchens. A private kitchen is a restaurant that can’t call itself a restaurant. It can’t openly advertise, it can’t post a menu for passer-by to see; in fact it can’t, really, be openly visible to passer-by at all. They don’t even have official websites, relying instead on word of mouth and other means to get the word out. Because it’s not a restaurant, you see. It’s a private kitchen. Private kitchens operate in a legal gray area. What usually happens is that some awesome (most of the time) chef and some partners buy a space (like an apartment) and turn it into a restaurant—errr, private kitchen. They’re not subject to governmental oversight because they’re not officially restaurants, and because they need to be mostly invisible, they’re typically in out-of-the-way places that are hard to find. That’s part of the appeal, of course. Private kitchens are one of those worst-kept-secrets, clearly tolerated because there’s no reason to crack down on them. Despite the attention-grabbing headlines of these articles in Forbes (“Hong Kong’s Secret Tables”) and Business Week (“The Secret World of Hong Kong’s Private Kitchens”), private kitchens are by no means secret. Word of mouth goes a long way, as do food blogs that openly list their names, phone numbers, and addresses. Someone told us that every time you share a private kitchen phone number with someone, you’ll get two in return. I like that. Technically, private kitchens are clubs, for members only. But they’re clubs in the same way that bars in Utah are technically clubs: to be a member, you must show up, fill out no paperwork, submit to no screening, and pay nothing (or next to nothing). Then you’re in! You’re a member! So last night Cate and I became members—i.e., went to—one of HK’s most excellent private kitchens, Fa Zu Jie. According to this website, it’s one of the “most exclusive,” but that just means you have to wait a month for reservations. (It seats only 30.) But it’s worth it, and it starts with the drama of finding it. It’s hard to convey just how un-noticeable this alleyway is. At 7:30 on a Thursday night in the Central district, there are a lot of people buzzing about. You would normally blow right by. Walk down the alley, and there’s a restaurant at the end. But wait! That’s not it. That’s a Mexican place. A real restaurant, with a sign and everything. Inquire at the host stand of said Mexican restaurant, and you will be directed to a dirty, fluorescent-lit stairwell that looks like something from the set of Seven. Signs posted say “Private Property. Please do not sit on these stairs to drink.” Nice. Because these places don’t have liquor licenses (though why, as a members-only club, they couldn’t sell wine to members is beyond me), they’re BYOB. A few descriptions of the more obliquely titled courses. The “summer colour” was a frozen watermelon appetizer, with a spicy Shanghainese dollop. The second course was a cold Japanese udon noodle with a variety of little tasty treats hidden inside. Yellow croaker is a small yellow fish, steamed. The soft pluma was an incredibly rich piece of pork atop deliciously rich rice. Red dress, white hat was a vanilla macaron (the white hat, bien sûr) accompanied by two strawberries. The whole meal was fantastic, and I’m not even much of a seafood fan. We’re now itching to try some of HK’s other private kitchens. Some serve only dessert. Another features opera singing from the executive chef. And then there’s this culinary-life-changing experience a former HK Fulbrighter describes. So we’re ready. We’re going to start working the phones. Anticipate another report in 6–8 weeks. sounds like you’ve made an important discovery! so jealous…. What’s the cost of dinner in a place like that? 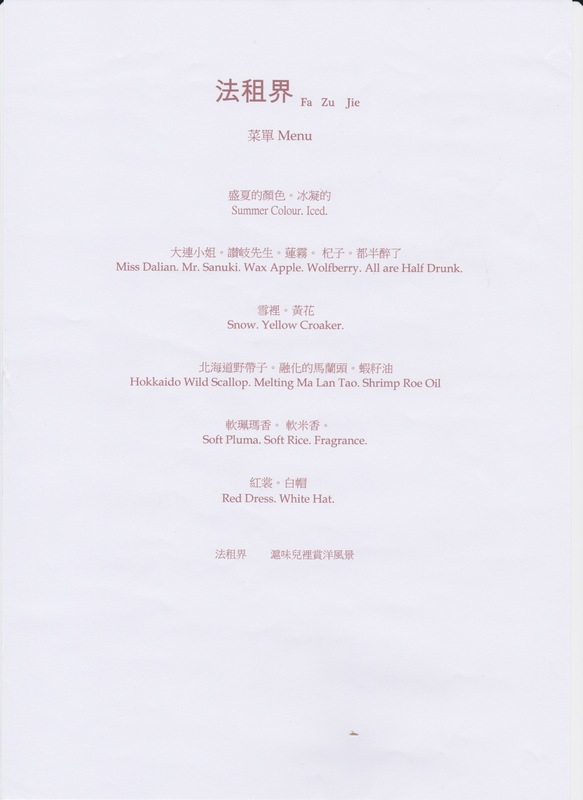 We paid HK$1300 for the two of us–about US$170–including gratuity. A great deal, really! Wow! I’ll have to find one and make reservations for the next time I’m in HK. I didn’t know these existed! How did you make a reservation here? Their contact information is here. I think they take reservations only by phone.